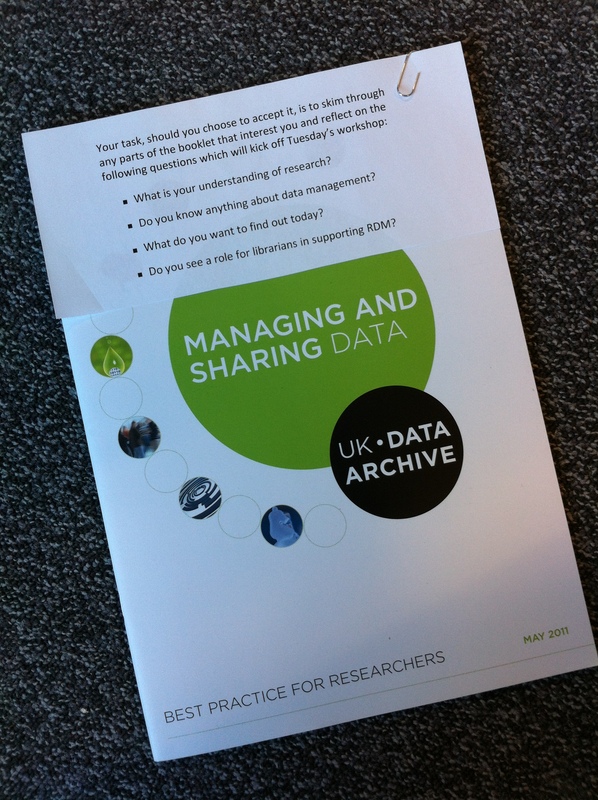 Yesterday’s event for Library and Learning Services staff was the third in the series of research data management (RDM) workshops being run by Digital Curation Centre (DCC) staff for the University of Northampton. Our ‘institutional engagement’ with the DCC is part of a sector-wide initiative to enhance the skills of researchers, and those who support them, in RDM. As a basic introduction, the session started by clarifying what research data are, then covered data management planning, data sharing and the skills required to support these tasks. It concluded with a round-up of progress in RDM activity at Northampton. Interestingly, some of the most energetic debate focused on the challenges of sharing data. From the point of view of a librarian, sharing resources is fundamentally a desirable thing, but colleagues were concerned about issues such as accessibility, copyright and licensing. Our discussions ranged from the technical to the cultural, eventually concluding that the challenges of data sharing were as much the latter as the former. Most of these draw on the key skills of an information professional, only the application is new. Thank you to Sarah Jones and Marieke Guy from the DCC for running this workshop. The presentation and workbook are available from the DCC website. If you would like to know more about services for RDM from the library then please contact Miggie Pickton. Posted on April 17, 2013, in Library and tagged DCC, research data, training, Workshops. Bookmark the permalink. 2 Comments. Lots of institutions are already offering these services to researchers through their libraries. The challenge is making the researchers aware of the services and of librarians as authorities on these services. This requires not only buy-in from lab PIs and from their PhDs and lab managers, but an active alliance with them as well. Identification of missed opportunities for RDM training. It’s just as much outreach as anything else. I’d be interested to see how librarians are reaching out to the researchers in the departments, labs, and centers they serve. I agree that awareness-raising is a challenge. As Research Support Librarian here at Northampton I have regular contact with researchers, both formally, through university committees, and informally, by email and in one-to-one and small group meetings. I use these interactions to promote all our services, including RDM training. The various teams that support our research community also use this blog as a promotional tool to highlight workshops, events and other research-relevant items. We’ve positioned the Research Support Hub as a ‘one-stop-shop’ for Northampton researchers – saving them time by gathering all the local news in one place. Of course success rates are mixed. The key is to deliver any service at a time and place when it is useful to the individual researcher – but that’s another story!